If you are not using a NASCANNA keyboard, you need to take some special measures in order to type long vowels on the keyboard that is in common use in Ireland, the so-called UK/IRL keyboard. Here is how it is done. You can put a fada on a vowel (a, o, u, i, agus e) by pressing the key “Alt Gr”, and keeping it pressed, before and while the appropriate key is pressed for the vowel. An á, ó, ú, í and é will be obtained in those cases. If capital letters are required, one must press Alt Gr at the same time as the Shift key, and keep them pressed while then selecting the appropriate vowel. An Á, Ó, Ú, Í and É is obtained in these cases. There are other ways too, but the above mentioned technique is the most easy. It is possible, from within MS Word, for example, to select Insert from the menu, and then Symbol to place any character from a broad range, including vowels with a fada. In OpenOffice Writer, you need to select Insert and Special Character to acheive the same result. Designate the keyboard as Irish / Gaeilge. 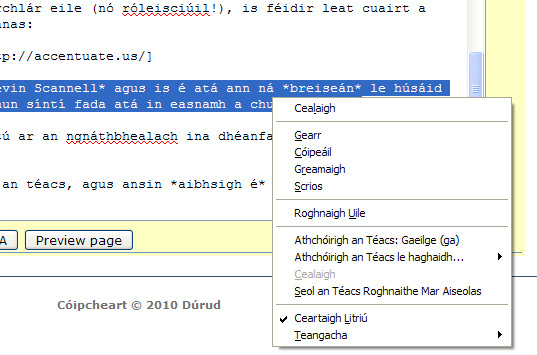 To write a síneadh fada, just press the normal vowel key while the ALT is selected, and that’s it. If you have not selected an Irish keyboard: To obtain the fada, one needs to select the Option key at the same time as the key e, followed by the vowel that needs the fada. ... and so on with the other vowels. If you need a capital letter with a fada, follow the same sequence along with pressing the Shift key. This is handy for anyone using diacritics of any type. Yet Another Way ... Check This Out! This is another facility developed by Kevin Scannell and it is an add-on for the Firefox browser. You can use this to put in fada signs where they are missing. You download the add-on in the usual way. It is very easy to use. Just write the text, bare, with no fada signs, right select the mouse, and then pick Athchóirigh an Téacs: Gaeilge (ga), or the English version of this as appropriate. This will insert the fada signs. Note that the entire text of the window in question is selected. With this add-on you can add the fada signs for applications such as gmail, blogs, Wikipedia, and so on. Watch it! As on any occasion where control is surrendered to the computer, you need to check the result. Be careful about short words in particular.